Rated 5 out of 5 by ppasolvr from Liked it! Seems either you liked it or didn't, no in betweens, I'm glad I decided to try it, as I usually don't try anything with only 2 stars, and seldom 3 stars, but when I read the reviews, I saw so many differences in opinions. The only thing missing might be the interactive story line, but to me, just the fun puzzles and magnifying glass part of the HO scenes took care of that for me. I really enjoyed it. Rated 5 out of 5 by mspaws from Blast from the past! I just love these relaxing games. Has a little challenge to it. Hidden objects are not difficult to find. I don't care for puzzles and these were a little challenging to me. Music is soothing. Old school, but wonderful positive game! Some reading inbetween scenes. Will be a game that I will play again and again. A buy for me! Rated 4 out of 5 by swanee22 from love matchmaker2! I own the first matchmaker, and I did like it. But this one is much better! I like that you have to think a bit to work out mini games etc. Great graphics, easy to play and altogether a pleasant game to play! Rated 4 out of 5 by JustTheFacts from Excellent HOG With Old-Fashioned Style! BASED ON COMPLETED GAME FIRST IMPRESSIONS Don’t like pure HOGs. Can’t stand romances. Never glad to see photo-realistic graphics. Yet I love this superficially simple little game. Old fashioned graphics, no voiceover, no fancy cinematic cut scenes. Yup, they are all there, the signs to a low budget game. But it is actually an excellent game, capable of producing hours of absorbing and involving fun. Provided you recognise it for what it is. A really well produced and intelligently designed HOG. It has puzzles, and you will still need some adventuring skills, but the fun lies in how those things are woven into a simple HOG game. SIGHTS & SOUNDS Although the graphics are not widescreen, they are very impressive. Good colour, clear images, nice detail work. Just beautiful to look at. The sounds are also superior to many games. Excellent ambient sounds, and relaxing not too repetitive music, with a light touch of romance without going schmaltzy. WHAT’S HAPPENING? The story is pleasant and quite interesting, even though it is not the major focus of the game. A deserted bride brings a curse down on a town, which then sees no marriages or wedded bliss for 20 years. You, matchmaker extraordinaire recently retired from your previous Matchmaker game, decide the town needs your kind of help. But there is much to be done apart from matchmaking, and more to the story than a simple loss of romance. You must solve the mystery of the “Curse of the Deserted Bride”, and free the town from its loneliness. So you must juggle clients, social engagements, interviews with people who may offer you clues, and searching for the dolls that are linked to the curse. GAMEPLAY This is the fun part of the game. There is no one type of game dominating here. 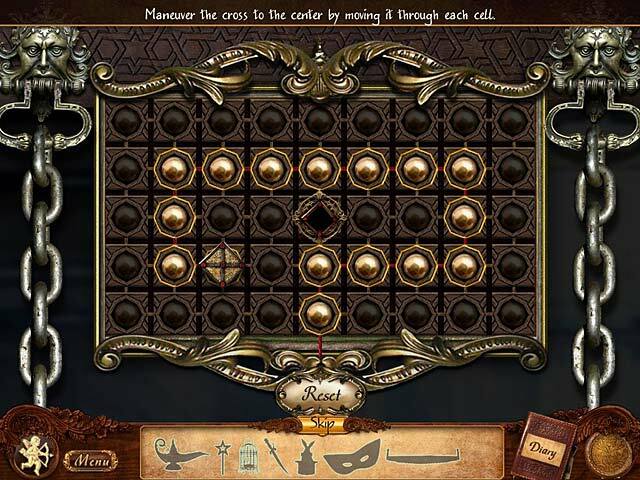 There are HOPs of course, interactive lists that are interesting in themselves, with many zoom in spots, and locked compartments, and they involve a large variety of mini-puzzles within and without. But there are also many other visual puzzles to solve! Including: spot the difference, jigsaws, rebuilding or repairing from a diagram, completing a list of actions that require you finding and using things in the location. The adventure gameplay is relatively easy, our work is nominal at most, and there are hints (that are hints) from a little cupid fellow who looks just perfect. There are also 13 dolls to be collected as part of the resolution of the curse. These are nasty things that clash with the overwhelmingly pleasant atmosphere of the game, but I love them for that and their eerily imaginative conception. There’s a map which shows us where we found the dolls, a journal that keeps the history up-to-date, and objectives list that is where we find the next scene to play. I really like this method of introducing the next HOP locations. Just a bit different, whilst logical and easy. And wrapped around this structure is your choosing of suitable matches, based on items found in their personal spaces. Assessing their compatibility, setting up a date for the couple and so forth, all tied neatly up in a bow. Love it. COMBINED IMPACT I managed to lose track of time during the demo on this, which I tried just today. Had to have it immediately to continue. Playing the full game only confirms my initial impressions. This is a fine game. The making of it must have been a work of love. Different, and thoroughly enjoyable. Rated 4 out of 5 by ideclair from Neat! Love the many scenes and mini puzzles! Any more like this??? Rated 4 out of 5 by Hairteach from Interesting mix of genres I ended up liking this game more than I thought. I enjoy interactive HO scenes. Theres also the restoring of various things in the story like a vintage car. Overall, a nice mix of interactive qualities and enjoyable storyline. Rated 4 out of 5 by kdreetz from Big Variety Interesting storyline - you must play matchmaker in a town that's lost all hope for love. 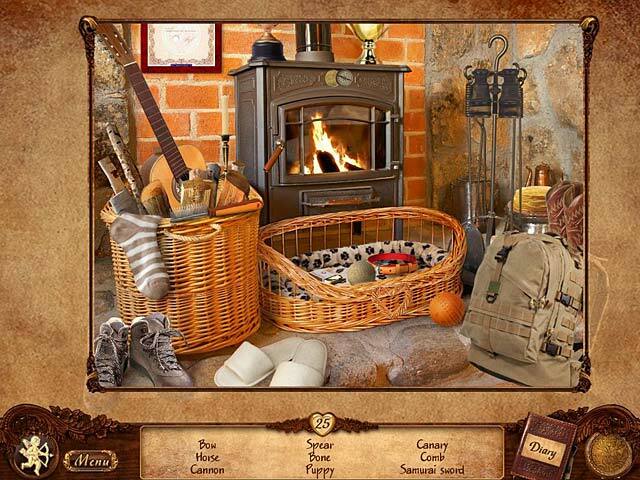 The game consists of a variety of tasks including interative hidden object scenes, find differences, finding and placing objects to complete a task and many others. I HATE custom cursors and this game does not have an opt-out, but it didn't seem to bother me. This is not your typical adventure game with a dark storyline so if you want to play something a little different, give Matchmaker a try. Rated 4 out of 5 by Anidea from I Really Enjoyed It! Some reviewers thought this had gone back to the old days...well if it did, HURRAY! I'm so tired of the dark games that are "the thing" these days. This one is fun with different varieties within the game itself - hidden object by name or shape and nice side games. The graphics and colors are good and I'm enjoying the matchmaking efforts of the main character. Give it a try! Rated 4 out of 5 by biscuitsmama from Surprising Change of Pace Game Oh my, I never would have thought that I would like this game as much as I do. I am so addicted to CE HOPA games that nothing else usually tickles my fancy. In Matchmaker there are so many things to do that I find it quite entertaining and a very nice change of pace. Not only are there some HO scenes but there are puzzles incorporated into each one. There are also tasks to be done such as renovate a room, fix an antique car, clean a park, decorate a setting for a date and so forth. In my opinion, this game is a gem and a keeper. I purchased after 40 minutes of the demo because I didn't want the fun to end. This is a game you really should give a try so you can see if you like it much as I do. Rated 4 out of 5 by helen1000 from hidden object game with a bit of depth an interesting storyline and not just your simple hidden object game - you have to open areas and complete all sorts of different games to finish a chapter. i really enjoyed it and it lasted for hours too. Rated 4 out of 5 by persephonie from An ok game I have played a few wedding themed games and the overall look of this game is very similar But I was pleasantly surprised I expected it to be non stop HO's but it wasn't .There was a wide range of puzzles some more difficult than others . The developers have worked hard to come up with something a bit different Your role is to help reveal a secret of a jilted bride in the past and bring some love back to the town . Although it is not typical of the games I play I did enjoy myself and I would probably wait till a sale and then buy it . 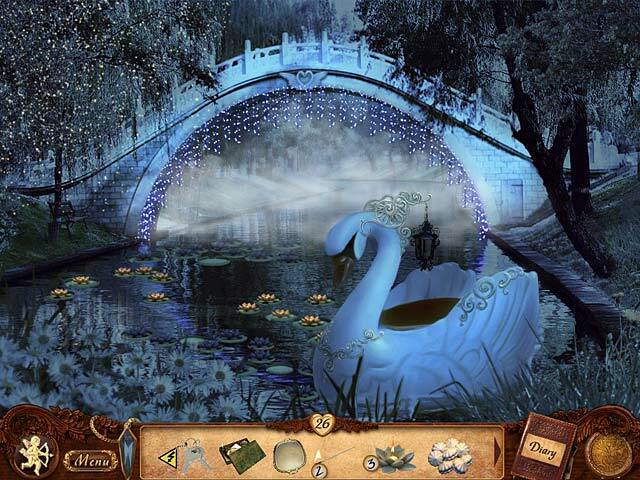 Rated 4 out of 5 by BobbyTobe6 from Easy Hidden Object Game A pleasant diversion. Lots of HOs, a little adventure and thinking required. Mini games can be skipped. Only played the demo and don't follow storylines, but will purchase. Good beginners game. Rated 3 out of 5 by rosekaufmann from QUICKLY BECAME BORING You are a matchmaker who thinks you can find the reason there have been no weddings in town for the last 20 years. Several types of HOS: list-based, silhouettes, differences No voiceovers - only written dialogue Fix-it tasks for the current residents Graphics are okay Puzzles are not difficult SUMMARY: Story seemed to move too slowly to keep my interest. Not much adventure. Run-of-the-mill type HOG. Good for beginners. Rated 3 out of 5 by lolaluv from Voodoo Matchmaking? This is the strangest storyline. A matchmaker that invades people's houses and businesses to match them up and find voodoo dolls. The game play is broken up, the dialogue is ridiculous and load times can be long, but for a free game credit it's an ok play. It's long, too. Given the dearth of new HOG/Adventure games right now it's about all there is to play, anyway. Rated 3 out of 5 by lucygirl7 from easy and relaxing Sometimes you just need a game like this. it's certainly "old school" but it's relaxing and easy to play and the story line is cute. All sorts of different hogs and puzzles within games. There are all sorts of things to do, like redo and room, put together a vintage car, sort through junk, find dolls, It's a relaxing rainy (or snowy) day game to play. It's certainly more of a women's game. So for me it wasn't an "awful" game. it just depends on what you like. Rated 2 out of 5 by stonermom from Very Discouraged I am completely stuck trying to find gears at the watchmakers. There is no walkthrough and the community is silent about this issue. What a waste of money. 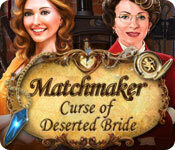 Rated 2 out of 5 by kristabelle61 from Matchmaker: Curse of Deserted Bride AVOID! I don't know nor do I care at this moment who made this game. They should go back to the school they went to and get their money back! This game has a lot of glitches and hangs up a lot. To add insult to injury no one seems to be able to spell. Example: Hoise = horse, Rabin = robin, etc. These misspells make it hard to find the objects. When you do find them you may have to click on them several times and then use the hint to cross them off the list. At this point I don't see me finishing this game. I'm sorry I tried it. Rated 2 out of 5 by loveelvis from Very boring game it's just an old game as we played 10 years ago! old music, old gameplay, though I chose to play in expert mode, there were sparkles everywhere to tell me where to seek, where to go, what to do in a place. I'm not a mechanic, or an architect or a painter. I hold on 37 mns but I'll never go back to finish the demo, it's too boring! Rated 2 out of 5 by Tflo from Snooze Fest! I know there are people that don't really like a challenge and just want to lose themselves in this type of syrupy story. I'm not one of them. Rated 2 out of 5 by sandyca from Sparkles I was excited to see this game, I don't mind "old school", and may have purchased it had you been given the option to pass on the sparkles. It's irritating when you don't even get to take a look around the scene without sparkles getting all up in your grill, just really irritating. Too funny, I as well left the building as soon as I got to the car, and never looked back. Rated 2 out of 5 by dancemom1 from Could have been a very nice game. This really isn't a bad game for a straight HOG. Graphics were nice, game play nice. HOGs a bit messy and junk pile. Games simple. Hint system...well, that left a lot to be desired. Storyline sounded good, but voodoo dolls? Wow! Story was very choppy and several times, it made me wonder why I was doing what I was doing..no flow to the game. Needed something to liven it up a little. Music got very annoying very quickly. Absolutely no frills on this one at all, but would be a nice game for a beginner. This one is too simple for me, so it is a pass. As always, try it for yourself and see what you think. We all have different tastes in games and you may find it quite enjoyable. Thanks for the reviews. Rated 2 out of 5 by sullysdragons from Not worth the bandwidth I would feel bad about leaving a lousy review, but I'll bet dollars to doughnuts this is an old game dragged out of the attic and dusted off to be sold. Like several other reviewers I exited stage right when I got to the car I was supposed to fix up. I uninstalled the game and I won't be second guessing that decision. It feels like a "formula" game. Tell a story at the beginning to get your interest, and then abandon that and have you running around renovating apartments and old cars. Really?? A total waste of time. Rated 2 out of 5 by pennmom36 from I COULDN'T FINISH THE DEMO! Sorry I can't do it! I was bored and the music irratated me. I made it through the first three scenes and I guess if you like to play puzzle after puzzle. the old school kind, than you will like this. No voices, no movement. Beautiful clear still pictures with he said, she said, next to continue blah blah blah. Rated 2 out of 5 by janniemst from SO disappointed! I enjoy the older type games...with music....ones which take me back in time...memories. Well, I thought this one would...but no, it was not fun after a short time. It went downhill for me the moment it talked about "black magic" with a voodoo doll found in her apartment. Then when I realized this was a game I was NOT going to enjoy, when I "quit" it told me "all progress will be lost"....I won't play any game where my progress is lost...I have to play a little here and there when I have time....SO this is NOT the game for playing at your leisure......unless you wish to Redo everything you have done up to that point. Not a fun game for me! Rated 2 out of 5 by bishky from Not a game for me! I was taught if I did not have something nice to say - say nothing. In this case I will try to be nice. This is just not a game that I feel is up to Big Fish standards. I don't know how old this game is but it is dated. The game itself is drawn in that old fashioned blurry way and the music sounds almost but not quite like it comes from a music box. If you wait to find things they point it out to you. Much too much help in this game. May be a good game for beginners but I don't think so. That's as nice as I can say how I felt about this game. I certainly will not buy this game!! Rated 2 out of 5 by whogirl from this is a blast from the past that should have stayed there I remember doing this kind of HO. I would play for hours. I played for about 40 minutes of this and had to quit. This game is like going from an ipad to a transistor radio. To those that don't know, a transistor radio is an ancient device for listening to music with a lot of static. The storyline is blagh. I found that I could care less about the people in the story. I also hate the way they make some areas so light you can't see anything in them. The only challange was staying with this game as long as I did.